Please join your neighbors, along with various elected officials and city agencies for a discussion with the New York State Liquor Authority (SLA). 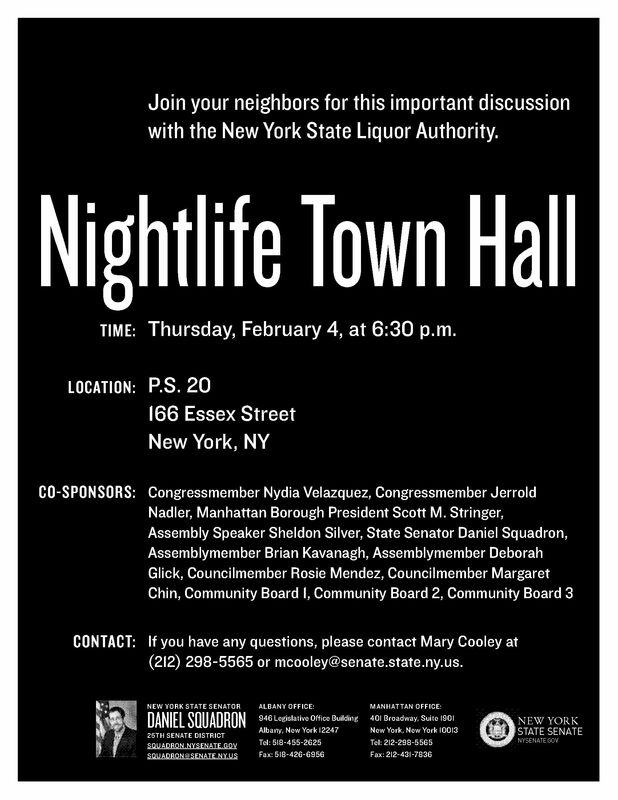 Spearheaded by State Senator Squadron at the request of Rosie, the Nightlife Town Hall will give community residents in Community Boards 1, 2 and 3 the opportunity to speak directly to newly appointed Chairman Dennis Rosen regarding nightlife and quality of life issues. Rosie encourages all concerned neighbors to join this important discussion. Call Jessica Nepomiachi of Rosie’s District Office at (212) 677-1077 or Mary Cooley in the Office of State Senator Squadron at (212) 298-5565 with any questions.